The first thing I did when I moved off the college campus in LA was get a cat. No, actually, the first thing I did was find an apartment that allowed pets. I hadn’t even been moved in for a day before I adopted a tiny black rescue kitten. 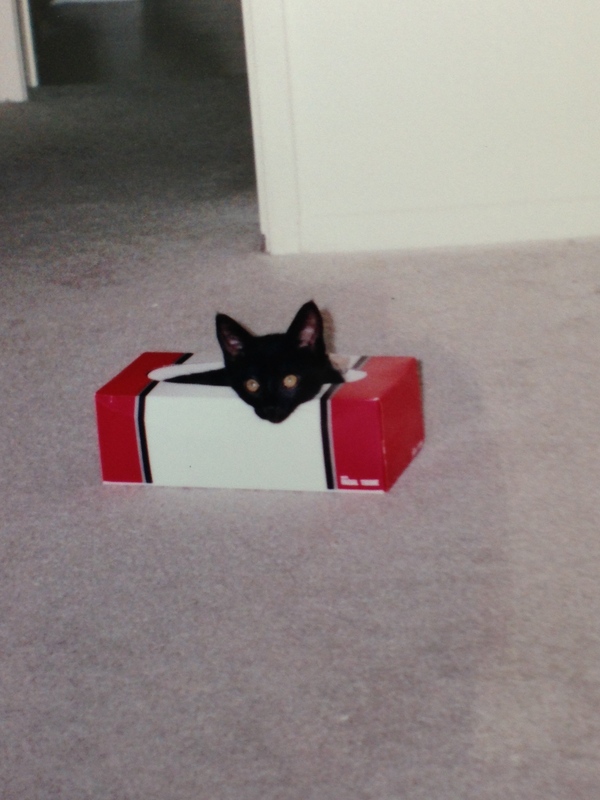 She had minimal fur and giant bat ears, and she could escape anything – including the box I put her in for the drive to my apartment. Bat Cat decided the coziest spot was under the brake pedal. While I was going 35 MPH. I had to use the emergency brake to stop. I do not recommend this. Despite Bat Cat’s attempts to kill us both, she was my baby. She slept in the crook of my arm at night. When she got bored and I hit the REM portion of my sleep cycle, she would attack my rippling eyelids until I woke up. She sat in my lap when a box wasn’t available, and refused to be locked out when I had boyfriends over. Bat Cat learned how to open doors. I was impressed. Boyfriends weren’t. I snorted. “I wouldn’t do anything. You’d get shots.” Not hard to guess how that one ended. My girlfriend JM – not to be confused with my friend M, as M is allergic to cats – soon arrived to share my apartment. JM also brought her cat. JM’s cat had been discovered in her dorm room and sent to live with her mother. JM’s mother overfed that black and white kitty something awful. When he arrived at our place, he was 26 pounds. I nicknamed him Shamu. He’d cuddle with four-pound Bat Cat, and she’d practically disappear. We put Shamu on a diet. It wasn’t hard. He couldn’t jump up on the counter to get Bat Cat’s kitten food. He couldn’t even jump out of the bathtub when JM gave him a bath. He just sat in the tub and mewed piteously. And you know how when cats get wet, they look all scrawny and rat-like? Shamu didn’t. He looked exactly the same. Huge. He couldn’t even jump on a bed. JM had to get a low futon. And that was just the waiting room. I put in another picture of Bat Cat because JM won’t give me one of Shamu. I don’t blame her. Someone would fat shame him. We eventually got Shamu down to seventeen pounds. He was still pretty darn big. One day I couldn’t find my black shoes. Shamu sat by the couch, cocking his head and watching me hunt through the apartment. I finally stopped, stared at him, and said, “Get up!” He refused. I picked him up – with a grunt – and discovered my flats. Shamu had covered both of them completely. They were size eleven. I don’t recommend this, either. We lasted two minutes. Shamu got spooked. Really spooked. He somehow hurled his massive body four feet up onto the top of the balcony wall. And jumped. We were two stories up. JM screamed, threw open the door to the apartment, ran through the poison gas, and down several flights of stairs. Meanwhile, Bat Cat decided that if her friend jumped off the Brooklyn Bridge, she would, too. She leapt up to top of the balcony wall effortlessly, and glanced once at me as I dove forward, desperate to stop what I saw as certain kitty suicide. Bat Cat jumped. Well, more like ran down the length of the balcony and then jumped. I followed JM through the haze of flea bombs, down the stairs, and found everyone by the grating that led to the parking garage. The cats appeared intact, though Shamu had tried to run through the grating and gotten stuck. Bat Cat loyally circled her friend. For once we were grateful Shamu was so fat. Otherwise we might never have caught them. Both cats had bloody chins. Shamu was a much bigger worry at the time than little Bat Cat. His chin bled heavily. The vet looked him over, his face quite serious. Then he stepped back and shook his head. The vet said, “Oh, of course. It’s not even worth a stitch on his chin.” He went into a lengthy explanation of how cats spread out when they jump, how they have a floating collarbone, and how they can fall tremendous distances. He said he’d seen lots of cats jump multiple stories and still be fine. I held Shamu in the waiting room while JM paid her bill. Most pet owners averted their eyes from us. Which was only right, because our group was a teary, bloody, be-fecaled mess. Pretty sure Shamu thought the drop was TOTALLY worth the bacon. * Let me just say, to all the justly outraged cat lovers out there, that I paid for my “let’s hang on the balcony” stupidity many, many times over. In blood and money. I undoubtedly deserved to suffer. I promise you, I did. Don’t tell PSCS, but I’ll probably jump off a balcony if I was assured of getting bacon after the hospital trip. Ah-ha! PSCS clearly controls the bacon. She controls most everything. It’s a good thing that she’s so wonderful. Thanks for saying it was funny. Bat Cat was less than one pound when she was under the brake. I was scared I would crush her if I pressed down on it too hard! I love your humorous writing style. My daughter also drives with her cats loose in the car. She wants them to be happy, so she drives the four plus hours from her house to mine with one cat sleeping on her shoulders and the other on her lap. I tell her it’s not safe, but she doesn’t listen. At least they’re too big to fit under her brakes. I’m blushing! Thanks, Nicki! Yes, cats in cars are tricky. At what point does the unceasing and unearthly caterwauling in a carrier become a greater danger and distraction than a cat chasing a bug around the car? Reminds me of the time I took my cat to the vet with my mother. This was pre-carrier days (at least for me). Mom’s job was to hold the cat on her lap. My mother, very fastidious, got “dressed up” and badgered me for my jeans and tee shirt. On the way to the vet, the cat got so nervous she pooped on my mother’s good coat. I had to pull over I was laughing so hard. Of course, no one got bloody but let’s just say there was an aura of poop in the air. Cats are good for a ton of blog posts. Loved yours. Hilarious. What happened to the “poop” coat? Can the smell ever be removed? Or did you even try? Thanks so much for reading, Kate. It was hard turds and the coat was a Misty Harbor raincoat (washable) so it was all good in the end. It was the last time my mother dressed up for the vet. 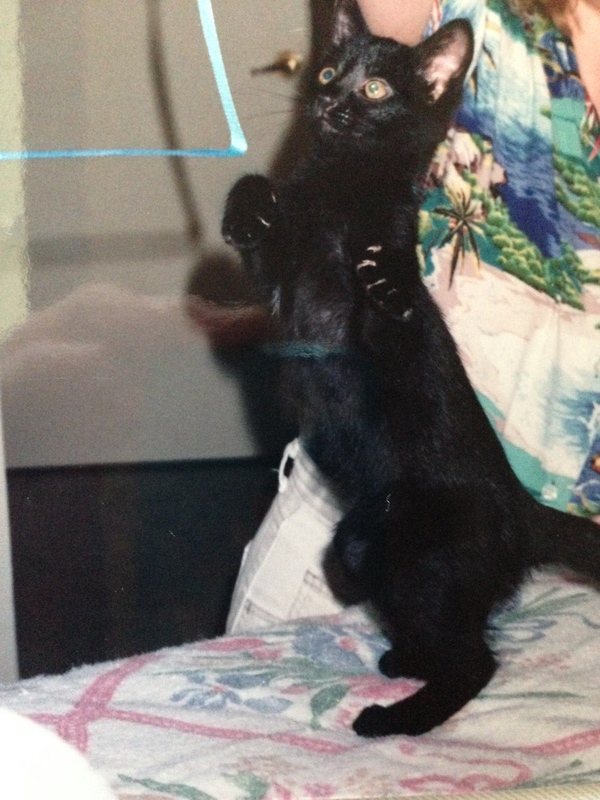 In the days before we started using carriers, a stray, half-grown cat arrived at our house. This was when we were living on the outskirts of Manila. I found a vet’s address and took one of the kids to hold the kitten on the ride. Come to find out, the vet’s office was surrounded by fields (enormous vacant lots). When we arrived, I opened the car door, and I doubt that you’ll be surprised to hear that the kitten clawed my daughter and ran into the field, never to be seen again. I do like carriers. I started to use a harness before carriers became the thing. It was better than wrapping in a towel and hoping for the best. An old school vet once told me that a pillow case works best in a pinch. I tried it. It worked! ROFL. Is he like Garfield? XD I also have a hottie for a cat. He was so fat! But he lost weight. Unfortunately, he also lost some teeth. Some bad cat beat him up. T_T I saw that when I visited home. I was truly terrified. I still wonder how he manages to eat. You mentioned carrying cats in pillow cases–I’ve heard those and those net bags for laundry are very good. It’s what they recommend cat owners use after/during an earthquake here. It keeps them calmer than a normal carrier (apparently?) as well as being harder to escape from.